The proposal for grant loan should be carefully prepared with the aid of grant budget template. Typically these grant budget proposals should be and void of the unnecessary word. This will enable the readers to focus and grasp the situation clearly. There should match between the budget and the outlay load. The allowances and tolerances also have to be mentioned explicitly.The income and projection should be written in very precise and particular terms without ambiguity. 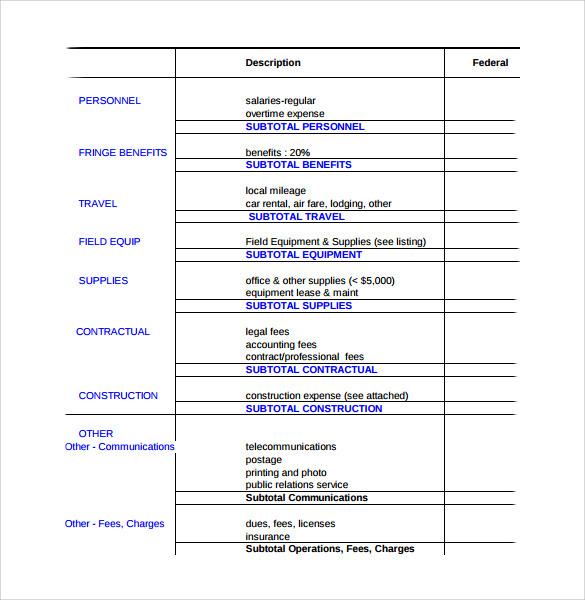 You can now download well-designed sample grant Business Budget Templates from the net in Word and PDF format as per your requirements. 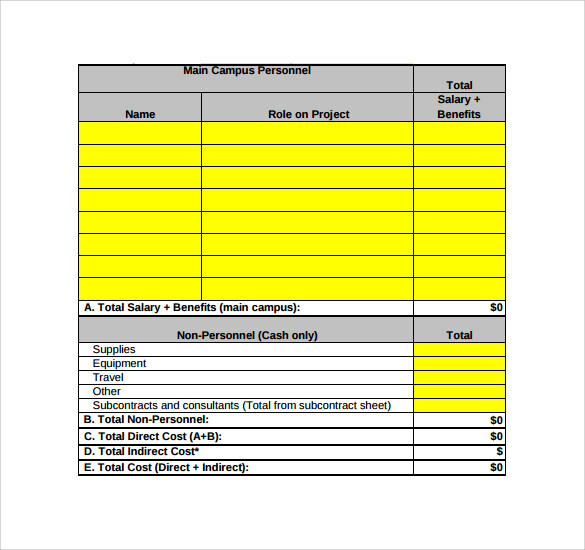 This sample of grant budget template is a sample which is drafted to seek grant for a research purpose. 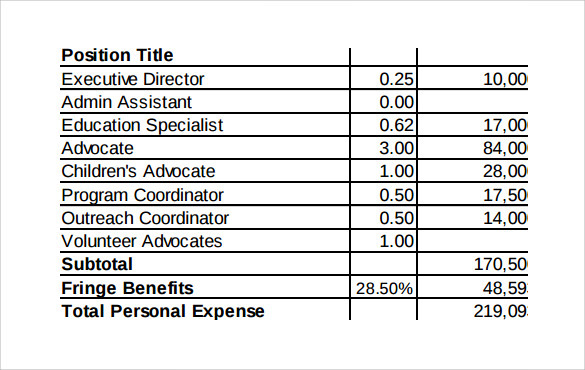 The budget estimation of this grant is divided in three different sections. The first section divides the total amount of money into three different sections namely personal expenses, direct expenses and travel expenses. The second part deals with the justification of all the expenses and the third part explains the project in details. 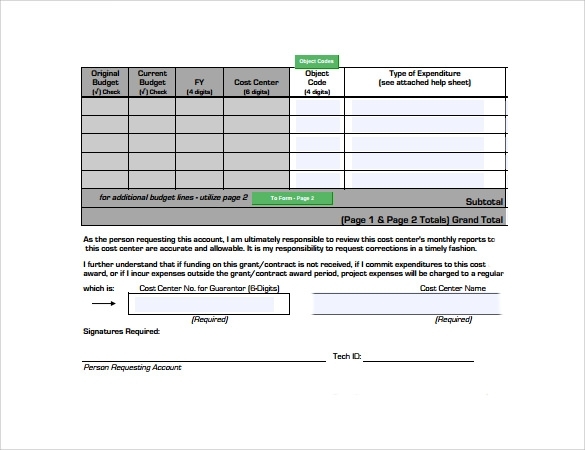 This sample of grant budget template is meant for the purpose of proof of concept. 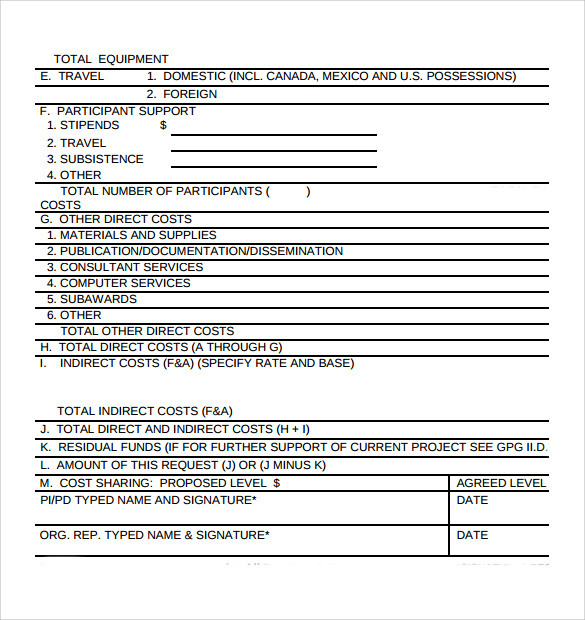 This template seeks to explain each and every subsection like budget details, allowable expenditure, personal expense, travel expense and subcontracts. 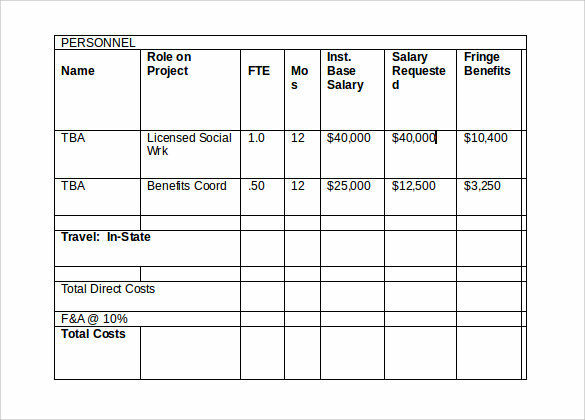 The chart given at the end of the page lists down the name of the person’s involved, salary and expenditure and the benefits reaped y them. 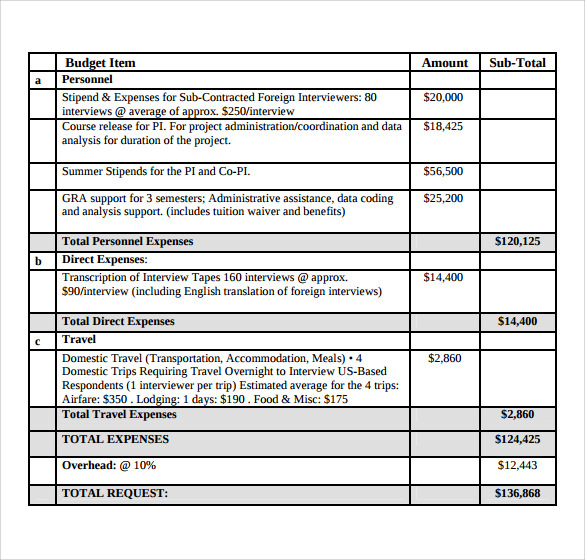 This sample of grant proposal budget aims to review the request for a grant. The scope of this proposal is to review the cost estimates and look into the operating budget of the organization. 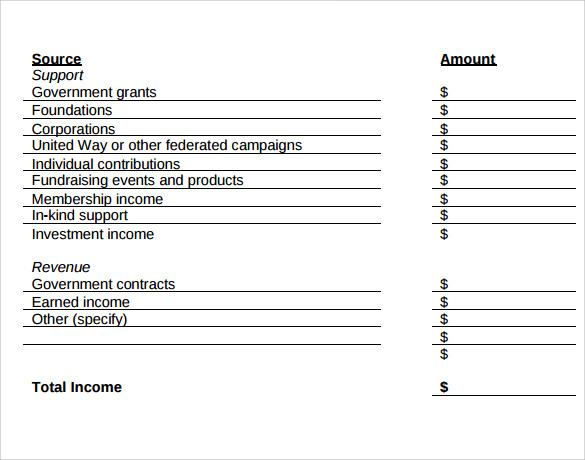 The final section has a chart which is divided into various subsections like organization expenses, budget program, source, revenue from different sections and so on. 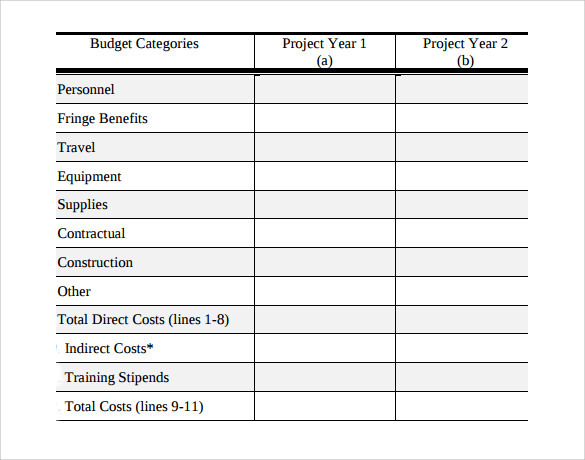 This sample of grant budget sample is a well defined and labeled chart which begins with the name of the project, project period and the date. It is followed by the sources of various income and expenditures. A total is calculated and subsequently deducted to arrive at the final value. Writing a successful grant proposal is more being aware of the format of writing. While writing a proposal, adhere to examples from real life. Mention the duration of the project in clear and specific terms. Make constructive use of milestones and mention very clearly who shall be responsible for managing the project. Do not forget to include letters of success if the sanction of grants depends upon them. A grant proposal in simple terms can be defined as a request for money. A grant plays a big role in their investments through which they plan to play a positive role. A grant proposal can be defined as a call of action which can be used to educate the board members about the utility of the project so that they can all join hands in common partnership to fight different problems and to achieve a specific objective.You can also see IT Budget Templates. What are the Factors Which Decide the Fate of a Grant Proposal? There are many factors which decide the fate of a grant proposal. One important factor which plays an important role is the nature and quality of the project. Your ability to convince the sponsors and facts supporting your claim would also play a very significant role in this direction. The capability of your partner and company as a whole would play an important role in determining the success of your proposal. Investors tend to like a clear and concise proposal which is to the point which would provide them with good returns. Getting a fund proposal approved in not a very easy task. It requires careful analytics and good rhetoric. If you are planning to write a proposal for the first time all by yourself our samples can give you a good and clear idea about how to approach the subject without being repetitive or boring.You can also see Cash Budget Templates.